I have a simple question for you: What do you sell? But wait. Before you answer it, realize that your underlying rationale will determine just how much you sell and how profitable your sales are. Last year, I asked if you were a pest, a peddler or a Demand Creator. That post generated a lot of conversation. Over the last six months, I've had the opportunity to observe many people trying to make the transition from a peddler to a Demand Creator. I've learned that there are some distinct shifts that are made by those who manage this transformation successfully, that those who fail don't make. Virtually every salesperson starts with a focus on their "stuff." While many salespeople (and selling organizations) think they're focused on their customer's issues, the reality is that more than 80% never get beyond a focus on their products and services. The first shift is to understanding and believing that your "stuff" is actually really different. The focus of the sales conversation moves away from the commodity towards the total value that is being offered. Next, as you become more comfortable that you are, in fact, different, the realization that that difference really matters to sets in. That when "stuff," even "differentiated stuff" stops mattering to the person selling. You realize that you don't sell stuff, you sell a unique advantage. The focus of the sales conversation moves away from the commodity and the company to the advantage the customer is striving for and the obstacles to achieving the desired advantage. It is in the second shift where right side value begins taking center stage. 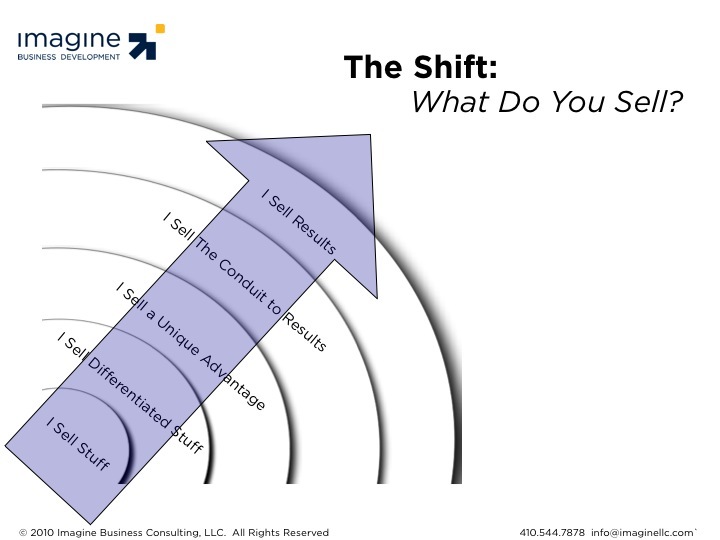 The next shift occurs when the salesperson or selling organization realizes that the advantage they create through their products, services, experience, and wisdom is actually a conduit to the critical results their customers are striving for. This is when the focus on selling ends and helping begins. The conversations sound much less like a sales conversation and much more like a business conversation. An outsider, eavesdropping on the sales conversation, would not be able to clearly determine just what product or service the salesperson is representing because the issues being discussed are much broader than that. The fact that you don't sound like a salesperson is no barrier to success. It is in The Third Shift where you start seeing rewards far, far greater than the effort being exerted. The final shift occurs when you realize that no one wants to buy your "stuff," your differences, your experience, your wisdom, or your advantages. You realize that everybody, in every business, wants the same thing - results. Sure, sometimes those results are clear and defined, and other times, they're ambiguous. Regardless, the desire is results and you start selling them. Your focus shifts exclusively to understanding the results your customer desires - better, faster and deeper than anyone else. You transform your sales approach from a solutions focus to a diagnostic focus. Your conversation with customers are all about results and the barriers your customers face to achieving them. You are no longer a salesperson. You're a business person who sells. Because of this, you become the trusted resource that customers seek out. Your sales approach becomes your unbeatable, sustainable competitive advantage. You competitors become increasingly confused and frustrated; crying out, "We don't get it! Our stuff is just as good as theirs. No, it's better! Why do we keep losing business to them when they charge high prices?!" Making these shifts is not easy. Each shift requires a new way of thinking, new approaches and new skills. The shifts feel risky because they require you to leave your comfort zone and potentially struggle with the new skills. The rewards for making the shift, however, are outrageous. You'll feel good about what you sell, how you sell, and you'll sell far more and make far more money than ever before.